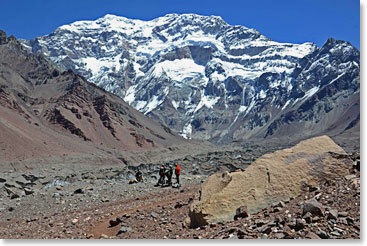 As one of the famously acclaimed Seven Summits, Aconcagua also dominates as the highest mountain in both the Western Hemisphere and the Southern Hemisphere. Standing at an impressive 22,841ft/6,962m, Aconcagua has become increasingly popular as a testing ground for those interested in climbing at extremely high altitude. Cold nights, high-velocity winds and weighty packs have shown many of our Berg team members what expedition climbing is all about. One of our climbers, Chris Von Gartzen is climbing for the PETS WITHOUT VETS who conduct free spay/neuter clinics to 3rd world countries; a highly important service in helping population control of feral/street dogs. You can read up her campaign here. We invite you to join us on this grand adventure as we travel from wine country to mountaintop. January 18, 2016 – We Made It! January 17, 2016 – At Berlin Camp – Tomorrow Is Our Big Day! January 9, 2016 – We All Made It to Plaza de Mulas!